A close up shows how the trumpet-like blossoms actually grow downward and have bright orange stamens protruding. A full 6-feet across overall, this plant is becoming quite enormous. 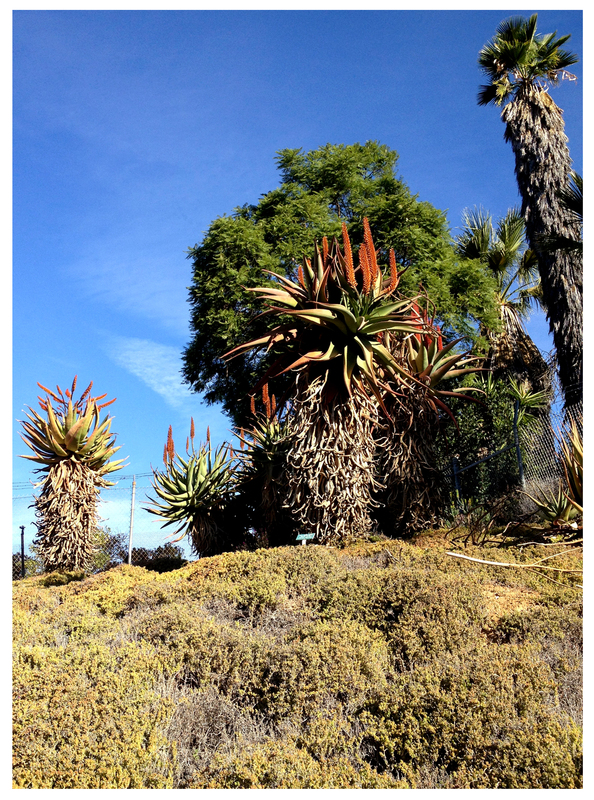 Although it’s growing very close to ground level, I fully expect that one day it will just rise up and become a full-on tree like its South African cousins at the UCR Botanic garden! … (click for photo). 6 feet across? Wow, those beautiful blooms must be huge. 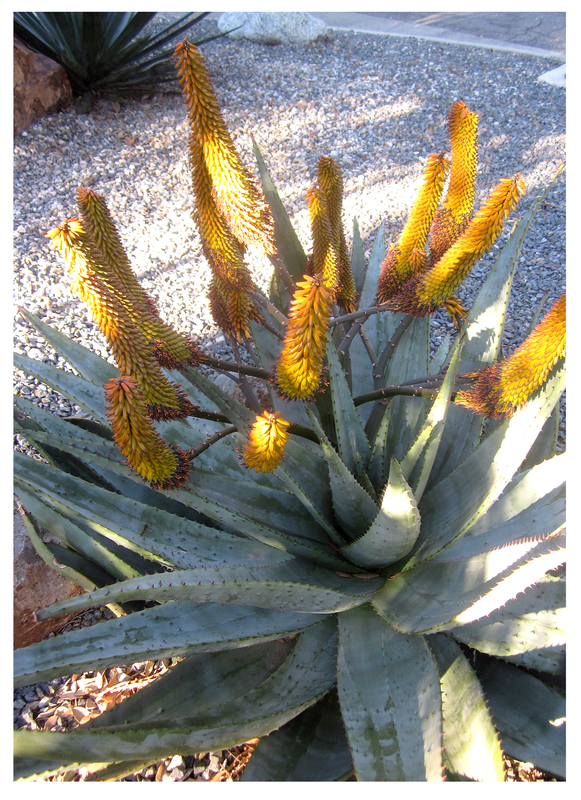 They are, Loree, which is why I count this particular plant one of my most prized! It’s no wonder why you prize it. My little ones that I planted last year have surprised me with a couple of bloom stalks. Can’t wait to see what the future brings with them. Thanks! Hey, Vickie, even when the flower stalk’s dead and dried I have to save it … it’s just too interesting and beautiful. Good luck with yours! the previous year’s bright red was wonderful. Here in Chicago we have nothing of course unless the plastic zinnias the new neighbors put in their pots out front count as something. Rodney is looking down from above right now at those plastic zinias and grinding his teeth. But soon spring will be here and I can begin getting Rod’s garden back in shape in time for his memorial in mid May. 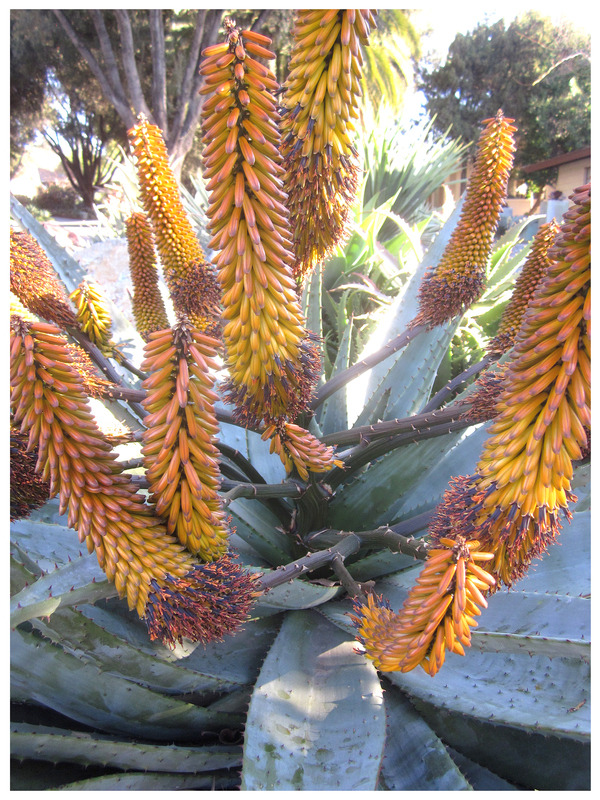 But back to that aloe ferox: WOW!!! My best to you and Paul. Thanks, Jim, for checking in. I’ll make sure Paul sees your comment … take care.